Over the weekend, I had a craving for one of my favorite, favorite desserts. And I looove sweet things, so you know it has to be good to be on my list of favorites! So what was my treat of choice? Black. And. White. Cookies. Let's all just say yummm together! 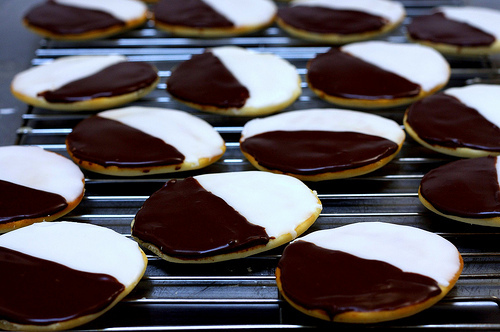 I have had a thing for black & white cookies for awhile. It all started back in college, when my best friend used to surprise me with them (our campus Starbucks had the BEST black & white cookie) when I wasn't having a good day (aw!). I haven't had one in awhile but for some reason, they were on the brain all weekend long. So while the hubs watched some football Sunday afternoon, I got to baking. Here's the recipe. 2. Whisk together flour, baking soda, and salt in a bowl. Stir together buttermilk and vanilla in a cup. 3. Beat together butter and sugar in a large bowl with an electric mixer until pale and fluffy, about 3 minutes, then add egg, beating until combined well. Mix in flour mixture and buttermilk mixture alternately in batches at low speed (scraping down side of bowl occasionally), beginning and ending with flour mixture. Mix until smooth. 4. Spoon 1/4 cups of batter about 2 inches apart onto a buttered large baking sheet. 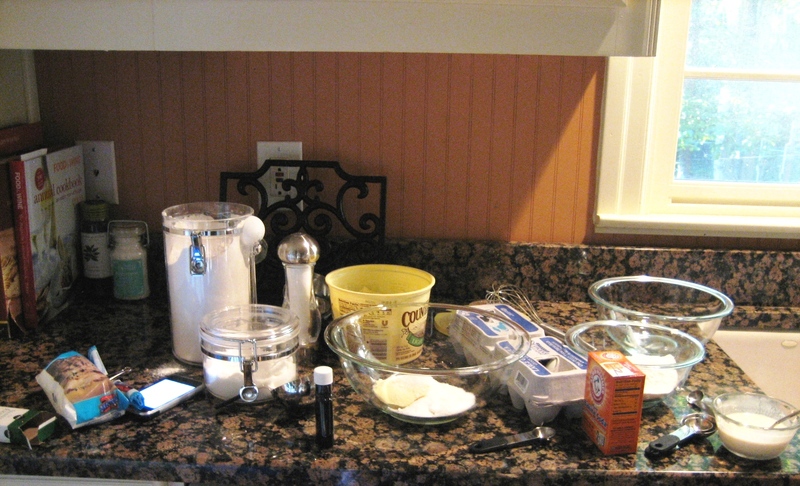 Bake in middle of oven until tops are puffed and pale golden, and cookies spring back when touched, 15 to 17 minutes. Transfer with a metal spatula to a rack and chill (to cool quickly), about 5 minutes. 1. Stir together confectioners sugar, corn syrup, lemon juice, vanilla, and 1 tablespoon water in a small bowl until smooth. Transfer half of icing to another bowl and stir in cocoa, adding more water, 1/2 teaspoon at a time, to thin to same consistency as white icing. 2. 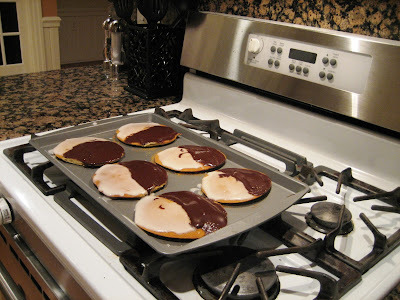 Turn cookies flat sides up, then spread white icing over half of each and chocolate over other half. Wouldn't you just love to see a big glossy photo of me in the middle of baking these, posing with a beautifully fluffed bowl of cookie batter? Not gonna happen. This is what it looks like in my kitchen while I'm cooking. So, I have to tell on David. As I'm mixing up the icing for these glorious cookies, he walked by to peek over my shoulder and check out the baking. And, sure enough, as he leaned over my shoulder, he was singing to himself "I'm sooooo iiiciiingggg." His own little suburban rendition of Gucci Mane (get it? "I'm so icy" ??)! How hilarious is that. Hey, I laughed for hours. Anyways, here's my finished product. Nowhere near as pretty as the Starbucks version, but I assure you... JUST as good. With cookies as good as these, a girl could eat them as a meal. Okay, okay... I actually did. In fact, I had two for supper on Sunday night!! Have any of you made anything delicious lately? Life is good when you are craving something sweet and you come across the perfect recipe AND you have all the ingredients in the house. YAY! I'm off to make cookies! Thanks for the great recipe.